All of the messaging services worth their salt feature a live video option, and Instagram is no different. But the company is keen to get more people using it and is worried that going live alone is too intimidating for some people. To overcome this problem, Instagram is testing a new split-screen option that gives users the chance to go live with a friend. 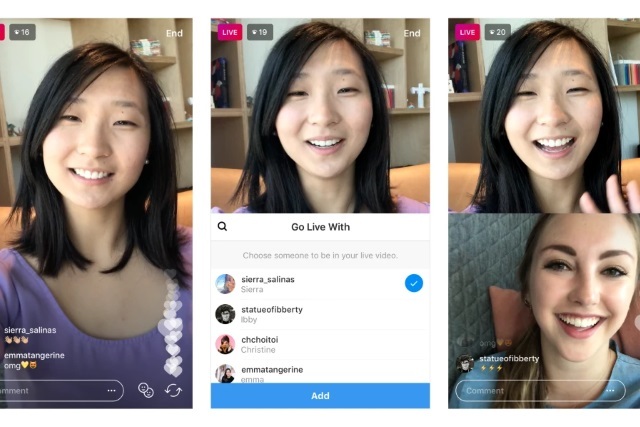 While this is billed as a way to make live video more accessible, there's far greater potential for this form of shared live video than Instagram is currently hinting at. With the new option it is possible to invite anyone watching your live broadcast to join you. While it's only possible to have one other guest taking part in your broadcast, it is possible to drop one person and replace them with another. It's not hard to imagine this being used by broadcasters to quickly link up with people in different parts of the country or different parts of the world for a report. Starting today, we're testing a fun way to go live with a friend. Now, you can hang out and go live together, whether you're just doing homework or catching up on your day. Live video helps you share in an authentic way, but sometimes it can be intimidating when you’re on your own. It’s easy to add a guest while you're broadcasting. Simply tap the new icon on the bottom right and tap "Add" to invite anyone who's currently watching. Once they join, you'll see the screen split into two and your friend pop up right below you. Your viewers can still like and comment as they follow along. At the moment Instagram is testing the feature with a "small percentage" of its users, but it is due to rollout to everyone in the next few months.